Baccarat is the ultimate high roller casino game. It has an aura of 'class' about it, mainly because in real casinos it's played in separate, cordoned-off rooms that cater to big stakes gamblers who value their privacy. Now, with the advent of live streaming technology, you can get all the glamour and privacy you want - in the comfort of your own home! The Live casinos listed below are rated based on the speed of games, quality of the live feed and table limits. Our #1 recommendaton is dublinbet, who offer an astonishing 180 games an hour - 3 games every minute! And as the feed is coming direct from a real casino (Fitzwilliam casino in Dublin) you know the games are 100% genuine. William Hill Live and Guts both use the slick Evolution Gaming live feed, William Hill having the edge with a table limit of £10,000. If you're at all unsure of the rules of Baccarat, or the proper strategy to give you the best chance of winning, we'd recommend reading through our Baccarat guide. dublinbet offer unlimited tables, so Baccarat is available 24/7. Each game takes an average of 20 seconds, giving 180 games per hour. 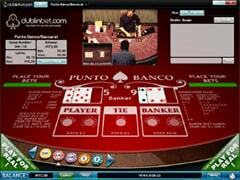 Beamed live from an actual casino, dublinet offers a unique version of Live Baccarat, with a truly authentic feel. 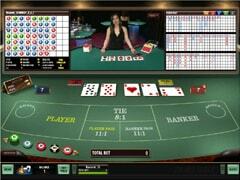 And with games every 20 seconds, it offers by far the fastest Live Baccarat available online. Each game takes an average of 50 seconds, giving 73 games per hour. William Hill Live have invested heavily in a unique VIP feed which provides them with dealers not found in any other casino. They also offer the 2nd highest maximum stake. However, getting a seat at one of only 16 tables can prove difficult at certain times of day. With games on average every 56 seconds, players can play up to 65 games per hour. bgo allows players to either play on their own or with others via the Single player and Multi player options. With plenty of tables available during the day and stakes set at a decent level, bgo is a casino we recommend for Mid Roller players. Ruby Fortune offer unlimites single player tables 24/7. Each game takes an average of 55 seconds, giving 65 games per hour. Generally a fast version of Baccarat and plenty of tables throughout the day to play on.